James Wade and Michael van Gerwen produced some fantastic performances in the World Matchplay at Blackpool’s Winter Gardens before both being denied places in the final by Phil Taylor and Adrian Lewis respectively. 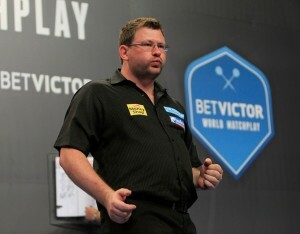 Wade followed up his opening round defeat of John Part with a fine performance in seeing off Gary Anderson to reach the quarter-finals. There, he edged out Simon Whitlock in a thrilling encounter before losing out in his semi-final clash against Taylor, who went on to win the title. van Gerwen defeated Colin Lloyd in round one before producing a fabulous display to demolish Peter Wright 13-3. 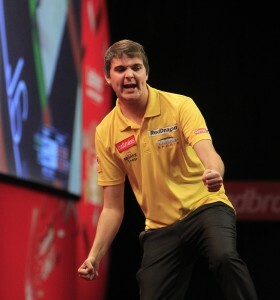 He then saw off Dave Chisnall to reach the semi-final, where he suffered a narrow defeat at the hands of Lewis. Michael van Gerwen moved into the last four of the World Matchplay with victory over Dave Chisnall at Blackpool’s Winter Gardens on Friday evening. The world number two completed a line-up of the PDC’s four highest ranked players for Saturday’s semi-finals. James Wade came out on top in an incredible quarter-final clash against Simon Whitlock to set up a World Matchplay semi-final with Phil Taylor in Blackpool. Wade edged the Australian ace 18-16 in a tie-break after a sensational display of darts from both players on Thursday evening. Simon Whitlock and James Wade will meet in the quarter-finals of the World Matchplay after the pair claimed second round victories at Blackpool’s Winter Gardens. Whitlock claimed a hard fought win against Kevin Painter, who he defeated 13-10 on Tuesday evening, before Wade saw off Gary Anderson 13-9. Michael van Gerwen also won through to the last eight after he completing a 13-3 drubbing of Peter Wright on Wednesday. Click below links for full match reports. James Wade, Simon Whitlock, Michael van Gerwen and Raymond van Barneveld all won through to the second round of the World Matchplay after an entertaining opening round in Blackpool. Wade, who won the Blackpool tournament in 2007, defeated John Part 10-8, while Whitlock saw off Jelle Klaasen by the same scoreline and ‘Barney’ beat Mensur Suljovic 10-4 on Saturday. van Gerwen joined them in the last 16 when he defeated Colin Lloyd on Sunday. For full match reports click the links below. The 20th staging of the World Matchplay gets underway at Blackpool’s Winter Garden’s on Saturday evening, with James Wade, Simon Whitlock and Raymond van Barneveld all in opening night action. Wade returns to the seaside town having reached the final of the prestigious tournament five times in seven visits, including 2007 when he won his first major title. Now a seven-time major winner, ‘The Machine’ begins his quest for further Matchplay success against John Part in round one. “I know what John can do and he knows what I can do,” said Wade, the world number four. “If we both do it then it should be a great game on Saturday and that is the only one I am thinking about right now. 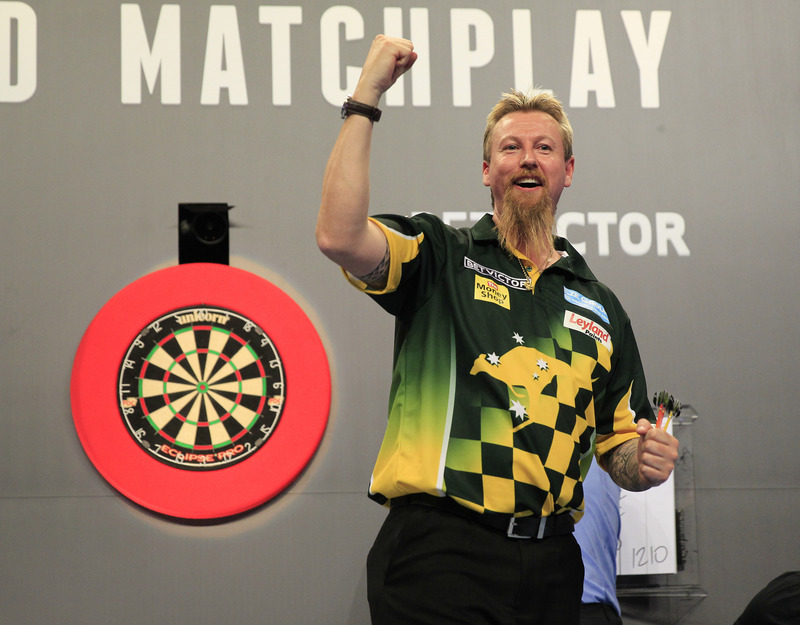 Whitlock takes on Dutchman Jelle Klaasen on Saturday night in round one. The Australian reached the final of the European Championships in Germany a fortnight ago and is determined to take his good form to Blackpool. “I have been playing very well recently,” said ‘The Wizard’, a former World Matchplay semi-finalist. 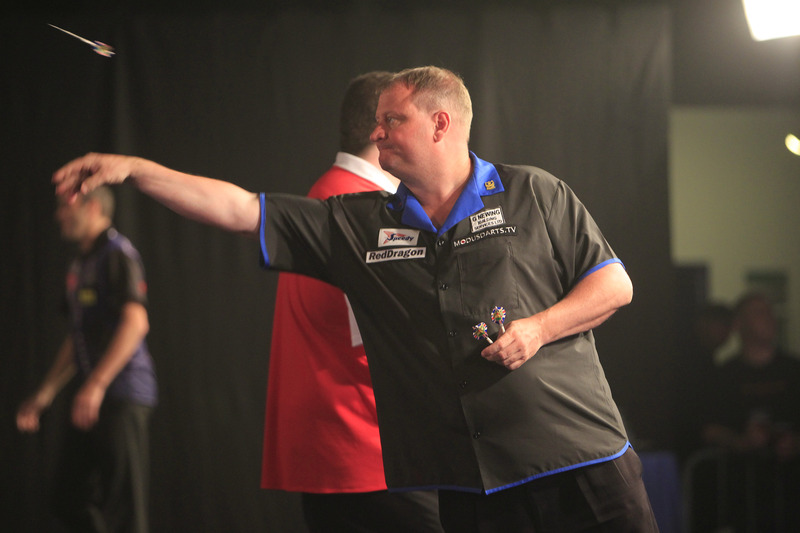 van Barneveld takes on Austrian Mensur Suljovic. Mark Webster is in action on the first of two sessions on Sunday, when he meets Justin Pipe in the afternoon. Paul Nicholson takes on Dave Chisnall in the evening session, before world number two Michael van Gerwen plays Colin Lloyd. Monday evening sees the conclusion of the first round matches as Robert Thornton faces Ian White. Andy Jenkins and James Hubbard will compete in the PDC’s seventh European Tour Event of the year after winning through qualifiers in Barnsley on Friday evening. The pair will take part in September’s German Darts Masters after a successful night’s work in South Yorkshire. Former World Championship semi-finalist Jenkins qualified for a European Tour event for the first time in 2013 with two fine performances, dropping just one leg in victories over Sam Hill (6-0) and Jim Walker (6-1). “I played well tonight and I’m over the moon to have qualified,” said Jenkins. “I’m looking forward to getting out to Germany and I’ll be working hard to put a run together. The European Tour is very important. It has a massive impact on rankings. 2012 World Youth Champion Hubbard also produced some encouraging performances, defeating Chris Aubrey 6-3 before edging out Prakash Jiwa in a last leg decider. The Norfolk ace then sealed his spot in Sindelfingen with a 6-1 victory against Ricky Sudale. “I’m happy with how I played,” said the 20-year-old. 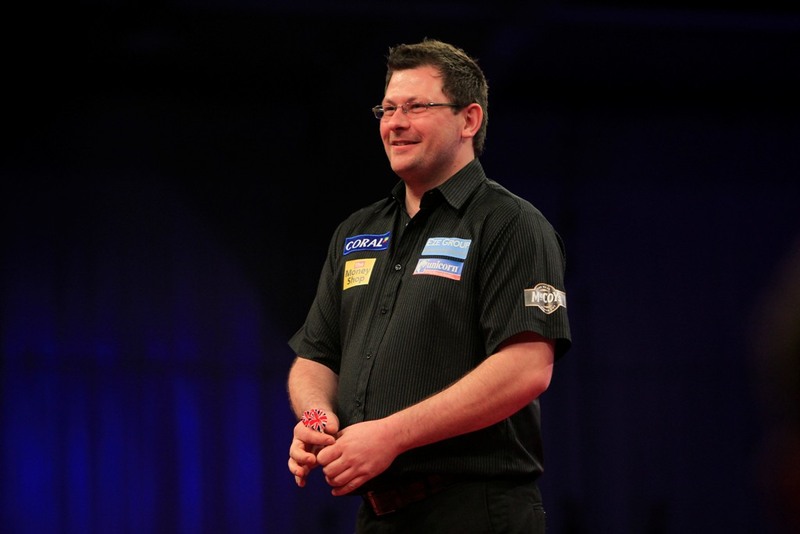 Former World Matchplay champion James Wade will begin his quest for further glory at Blackpool’s Winter Gardens with a first round clash against John Part, twice a runner-up in the prestigious tournament. Wade, winner of seven major titles, has reached the final five times in his seven visits to the seaside town, including a narrow defeat at the hands of Phil Taylor in last year’s final. Michael van Gerwen, who hit a nine-darter at the summer event last year, was drawn against 2005 winner Colin Lloyd. Former European Champion Simon Whitlock, who was also a finalist in Germany last weekend, will resume his pursuit of a second major title when he takes on Jelle Klaasen in round one. Robert Thornton will meet Ian White in Blackpool, while Paul Nicholson takes on Dave Chisnall and Mark Webster faces Justin Pipe. 2010 runner-up Raymond van Barneveld meets Mensur Suljovic in round one. The tournament, which celebrates its 20th anniversary, takes place between July 20-28. Simon Whitlock came close to successfully defending his European Championship title but lost out to Adrian Lewis in the final on Sunday. ‘The Wizard’ produced a fantastic run to the tournament decider, defeating Kim Huybrechts and Colin Lloyd before a sensational fightback in his quarter-final. 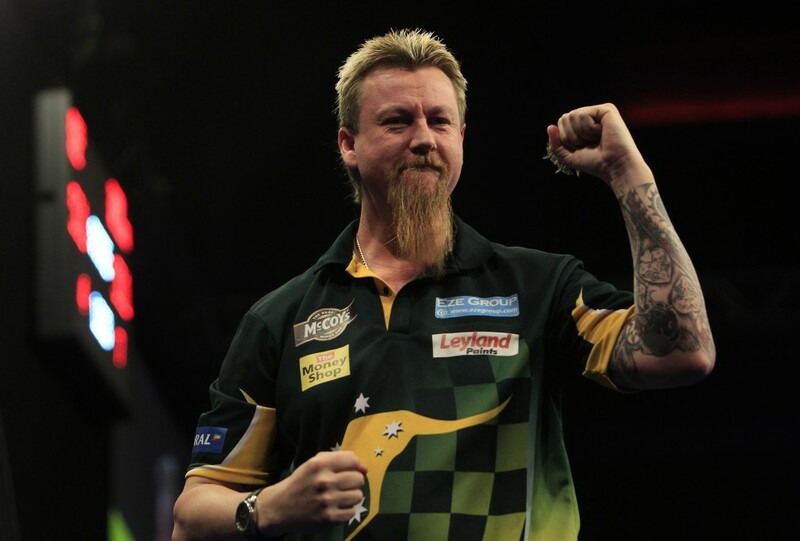 Whitlock trailed Jamie Caven 9-3 in the last eight but hit back, incredibly taking seven straight legs to seal a 10-9 victory, which he completed with a brilliant 146 finish. He then saw off Ronny Huybrechts in the semi-finals but ran into a classy display from world number three Lewis, who took the title with a 10-6 victory. Lewis also ended the hopes of Michael van Gerwen, who bowed out after a brilliant semi-final clash, in which the Dutch star hit nine 180s and took out a 150 finish. van Gerwen had produced a majestic display in Sunday afternoon’s quarter-final, averaging 105 in his victory over Jelle Klaasen. Robert Thornton missed out on a place in the last four when he lost a last leg decider against Ronny Huybrechts. Simon Whitlock and Michael van Gerwen progressed into the semi-finals of the European Darts Championship with sensational victories in Mulheim on Sunday afternoon. Whitlock produced an amazing comeback fron 9-3 down to defeat Jamie Caven 10-9, winning the deciding leg with a sublime 146 checkout when his opponent was waiting on 56. 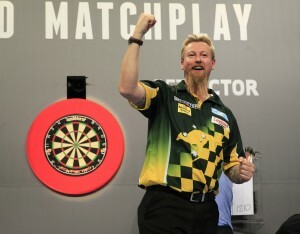 “That came from the heart,” said defending champion Whitlock, who will face Ronny Huybrechts this evening. “I was thinking about when Andy Hamilton did it to me at the World Matchplay a couple of years ago and I just hung in there and weathered the storm. van Gerwen averaged 105 as he defeated Jelle Klaasen with a brilliant performance, which included seven 180s and a 136 finish for the world number two. “I really wanted to win this game and I’m very happy to have won it,” said van Gerwen, who takes on Adrian Lewis in the last four. “It was a quality game and I’m very pleased to be through to the semi-finals. “I’m looking forward to tonight because I know I can play even better than this so hopefully I can keep on improving in this tournament. Robert Thornton was denied a semi-final spot after losing out in a last leg decider to Huybrechts. Lewis defeated Andy Hamilton in the afternoon’s other match.